Now that the obligatory release of the 2016 Topps Baseball set is in the rearview mirror, the famed baseball company has opened up the season with two products that are primed to set the table of any collector’s lineup. The 2016 Topps Gypsy Queen and Museum Collection sets are next on deck in Topps’ expanding baseball card line. This year’s Gypsy Queen set blends a classic retro portrait design with the clarity of modern card manufacturing to create a truly wide appealing collectible. With exciting action shots frozen in time by the masterfully painted canvases, the cards make for a journey worth pursuing. The 350-card checklist gives a nod to the past by honoring almost 50 Hall of Famers with a dazzling subset of short prints, while all the major stars and rookies are covered in the base set. The box provided for this review provided an array of inserts including two autographed cards and two relic cards. In addition to the two dozen mini cards that were randomly inserted into the packs, the box also yielded a pack of 10 parallel mini cards, which are part of a more limited set of 100 mini cards. For collectors seeking a fancier indulgence, the 2016 Topps Museum Collection will satisfy their hunger. Each four pack box boasts one on-card autograph, one autographed relic, one quad relic, and one prime relic. The thick glossy design of the Museum Collection cards are similar to Topps’ other high-end products, giving collectors a heavier feel that a premium product deserves. Each of the relic inserts that came in the box had vibrant patches that equally highlighted the relic and the player featured on the card. Especially attractive was the quad relic card that came in the box, featuring four prominent players from the same organization with a mix of bat and jersey pieces. 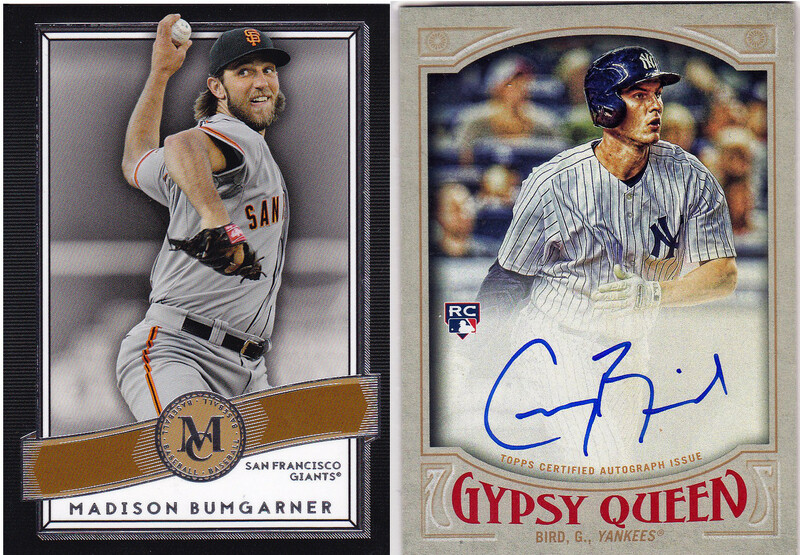 As collectors dig deeper into Topps’ releases during the baseball season, both the 2016 Gypsy Queen and Museum Collection products are worthy of a look. Whether it is a collector searching for a set oriented product in Gypsy Queen, or a guaranteed-hit product like Museum Collection, both issues offer satisfying returns for the purchase.